Shipshewana, Ind. 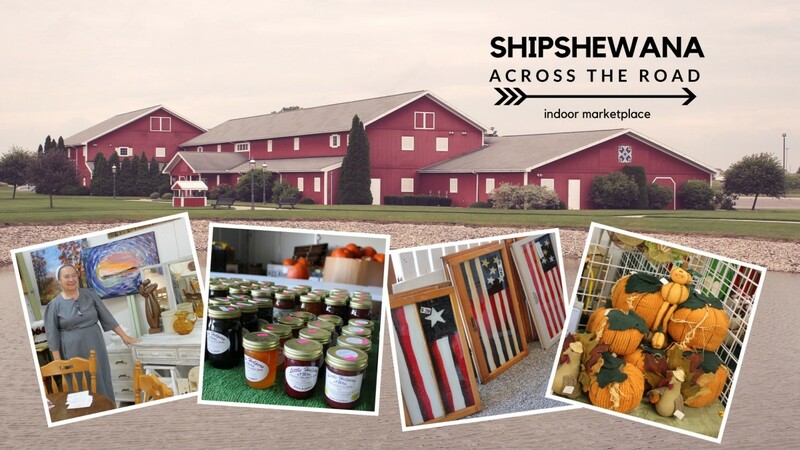 — As the days get cooler and the holiday season approaches, Shipshewana Flea Market is heading “Across the Road” for their Indoor Market which will feature new events this fall and winter. Visitors to the indoor market will be able to shop from more than 50 booths selling gifts, jewelry, home décor, dip mixes, handmade items and more. Shoppers can expect to see a scaled-down indoor version of the famous outdoor Shipshewana Flea Market. The market is scheduled to be open to the public every Friday and Saturday from October 5 to December 15 from 9 a.m. to 4 p.m. It will be held inside the Farmstead Expo Barn, just across the street from the Auction and Flea Market grounds. 2018 Indoor Market events include an Antique & Vintage Market (October 5-6), DIY Wood Sign Workshops (Oct 12-13), Trick-or-Treat (Oct 27), Winter Wonderland Walkthrough (Nov 2-Dec 15), DIY Craft Class (Nov 23-24), and Santa Visits & Kids’ Safety Day (Dec 1). There is no admission fee to Shipshewana Across the Road Indoor Market, and parking is free. For more information, call 260-768-4129. Find more on the Shipshewana Flea Market Facebook page.